My kids love Star Wars, and when we were watching Return of the Jedi, my son declared he wanted to be an Ewok for Halloween. 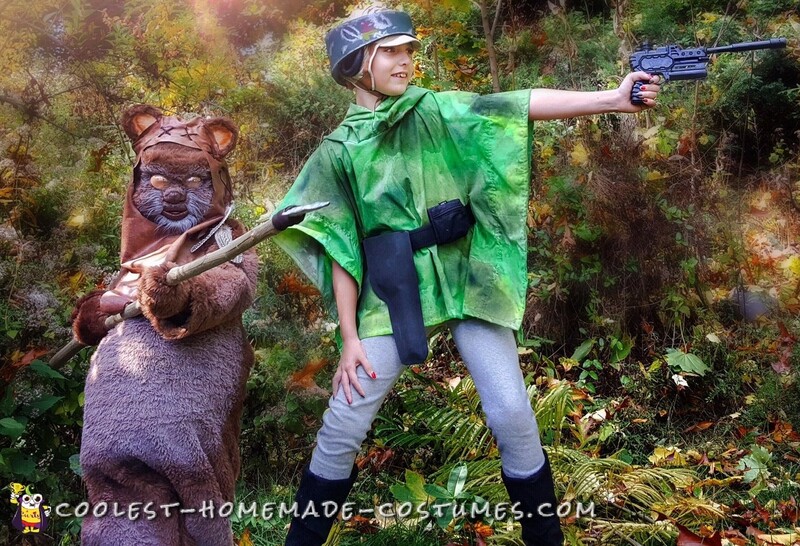 So, we needed to create these Halloween Star Wars costumes for both of our kids. I bought brown fur fabric at a local craft/fabric store, as well as brown pleather. Then I bought a cheap plastic face mask at the dollar store, some upholstery foam, and sculpey clay. I layered some foam with hot glue on the mask to shape the face more like an Ewok. Covered it with fur. Made lips and a nose out of the sculpey clay, and glued those on the mask. Found clear plastic eyes out of lip gloss packaging. Painted highlights in the fur on the mask for a more realistic look. I sewed the suit out of the brown fur fabric. Shaped and sewed a hood out of the brown pleather, and added leather string woven, like the Ewoks have, attached feathers to the end. I made wars out of foam, covered them in felt, and fur, and glued them into the hood. I made foot covers out of foam to go over his shoes, covered them in fur, and attached toes made from foam mats that I painted and shaped to look like Ewok toes. Also made mitten out of the fur fabric. I found a stick in the backyard and trimmed it up. Made an arrowhead out of sculpey Clay, and attacked it to the stick with hot glue, and wrapped it with leather string. We marched in our local parade and everyone loved his costume and kept yelling out to him how cute he was. He loved his costume. We decided my daughter would match him, and she would be Leia in Endor. I made her poncho out of an old sheet that I cut, sewed, painted with various green paints. Attached yellow stripes to the side of some grey pants that she had. Made the helmet out of foam mats that I cut, shaped, glued together, painted to look like Leia’s helmet. I bought a pilots soft helmet on eBay. I bought a utility belt from a local army navy store. Made Leia’s gun out of an old water gun, that I glued a long stick to, and spray painted black. I made a gun holster out of black foam sheets from the craft store. She already had black boots. Even though her cute brother got most of the attention, she enjoyed her costume.